Hello! We are halfway through the week! Today's look is another risk I took and is something I may never have done before having a fashion blog! I have tried dresses as skirts a bit, but I haven't done it with a maxi dress yet. I gave it a go with this top I recently thrifted and I have to say, I like the result! Are we surprised that once again the main color here is orange? Anyway, I got this maxi dress last summer, it was the first maxi I'd owned in years and I was looking at this shirt next to it and thinking "I bet I could put those together and have it work". I swear, I wouldn't have tried this even last year. I like trying out dresses as skirts when I can, because I feel like it gives another option for the dress. Otherwise dresses can be kind of limiting sometimes, especially in the summer. 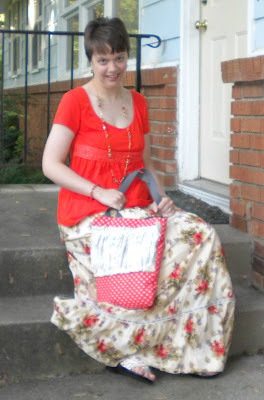 And of course my new orange polka dot Gussy bag looks super cute with this entire outfit! Can we say coordinated? Can we say Beth is a nerd? Speaking of nerdy things, if you missed it, I did a vlog the other day about my new Gussy bag. The post for that is here. And as I was leaving today, I decided to photograph naughty Miss Pippin here. She loves sitting on this half wall by our front door. We don't really like her to sit there because she's big and knocks stuff over, but she's a stubborn one. I'm surprised she was facing this way. Usually she stares at the wall. We think she sees shadows on the wall from the small window in our front door, but we're not really sure. Maybe we have ghosts. Who knows. The sun is shining, I love my outfit and I'm in a pretty good mood! I hope my joy spreads a little to all of you! Have a great day! You look great in orange! Maxi skirts are a lifesaver in the summer! 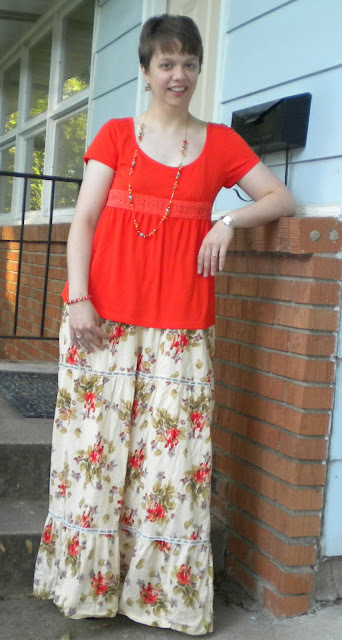 I love that maxi skirt with the casual top - so flowy and summery! Aw, Ms. Pippin is so lovely! I adore tuxedo cats. You are too cute! 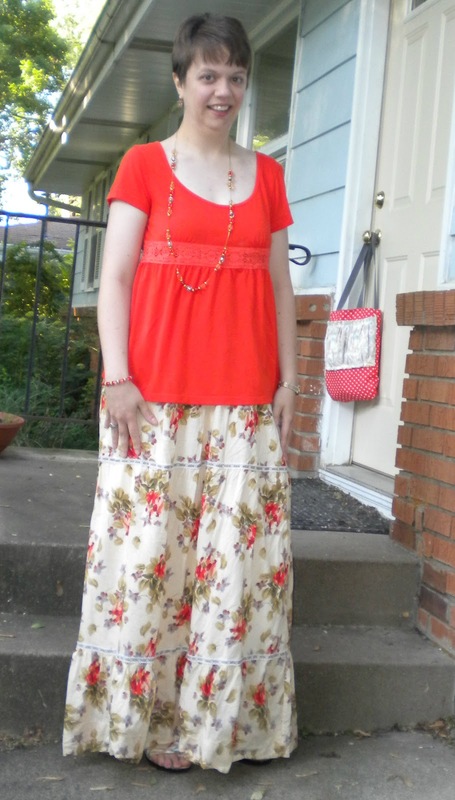 Love that floral maxi (skirt!) on you. I do love floral anything! :) Sending some joy right back at ya lady! Just love your naughty kitty...her white whiskers are so cute :) And this maxi looks awesome, wear this look more often! i love maxi skirts and dresses! and this floral one is so pretty!! your kitty is too cute, even when being naughty! That floral maxi is really pretty and I love that you wore it as a skirt! i LOVE dresses, so yes, I LOVE this look! The print on that dress is fabulous and I totally dig that you wore it as a skirt! I LOVE that look on you and the color - orange is perfect!! Right up my alley that's for sure! very pretty boho look, I like the dress as a skirt! The floral print is so lovely. The tangerine top is bright and cheery. Definitely an outfit that cheers up your day. One of my favorite outfits of yours! Yay for taking outfit risks! I think it is aweosme you did something outside of your comfort zone!! You look lovely in these bright colours, and I love the maxi dress worn as a skirt! I've done it once before and it was fun, but only in monochrome black and white, I'll have to try it with a bit of colour now! I really like this look! I have one maxi dress, and might have to try pairing it with a shirt to look like a skirt instead! Seriously diggin' the skirt. Hand me a fitted tee and a jean jacket and this one is a big ol' YES!